Prepare to call your friends out! This game is not for those with fragile egos, but come on...you can handle it! Ummm...it's FREE...why wouldn't you try it? 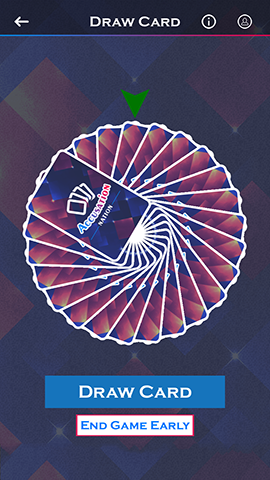 Play for free with up to 4 players, and start with 50 cards. Only one person needs to have the app to play the game. You can unlock unlimited players and more cards through In-App Purchases. The game is very simple. Players take turns being the Judge for the round (don’t worry, everyone gets a turn). 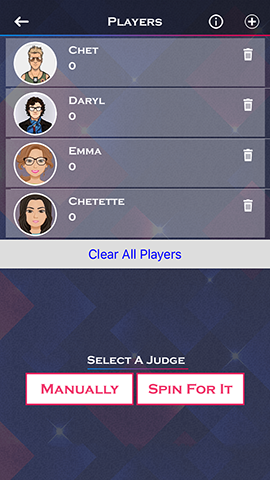 The Judge draws a card (in the app), and each player gets a chance to plead their case as to why they DON’T deserve to be associated with the card. The Judge makes his/her ruling (using the in-game timer is optional), and that player is awarded a negative point (for the round). 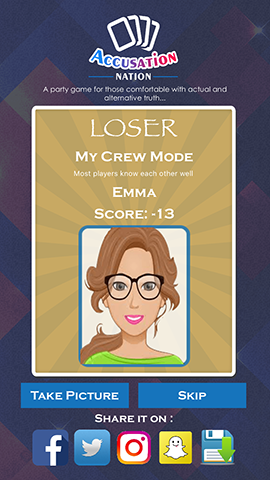 The first player to reach -13 points (can be changed) is declared the LOSER (of the game)! 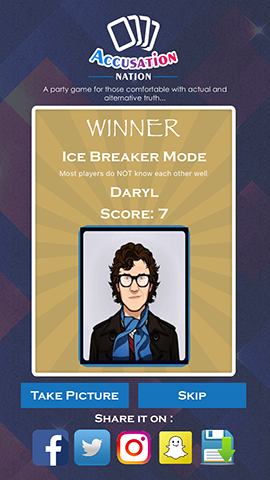 There are two different modes of gameplay based on how well you know the other players. This is the standard mode where most players know each other well. Players try to defend themselves and NOT get the card. A LOSER is crowned at the end of the game. 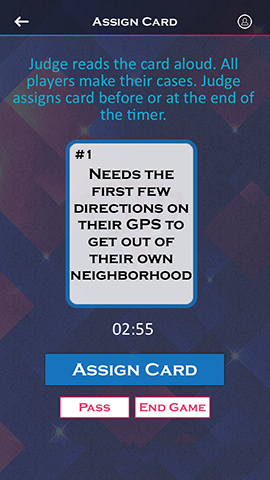 In this mode, most players do NOT know each well, so players lobby FOR themselves in order to GET the card. The game ends with a WINNER and hopefully you with that hot girl's number ;). Use FFF (For Free Forever)! Did I mention it's FREE??? Drop us your email to learn about the latest Accusation Nation news! #1 Is this game for Android too or just iOS? It is only on iOS for iPhone, iPad, and iPod right now. #2 Does everyone need to have the app on their phone to play the game? No. Only one person needs the app on their iOS device to play. Best of all...it is free to play for up to 4 people! 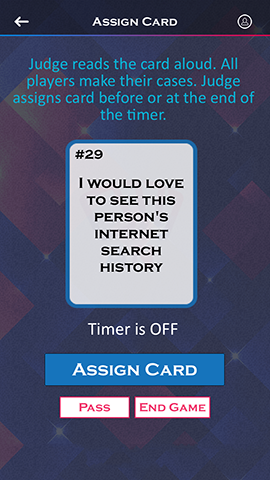 Have a great idea for a new card?! Submit it here! *All fields other than Card Description are optional. Emails are not sold or used for anything other than to thank you if your suggestion makes it into a future version of the game. Have a question not already answered by this site? Reach out!